Natural soy wax is a wonderful ingredient not only for making your own DIY candles, but also for use in natural skin care products. Since soy wax is used for making homemade massage candles it made perfect sense to me to use this wax to make all natural bath melts in my lavender bath melts recipe. 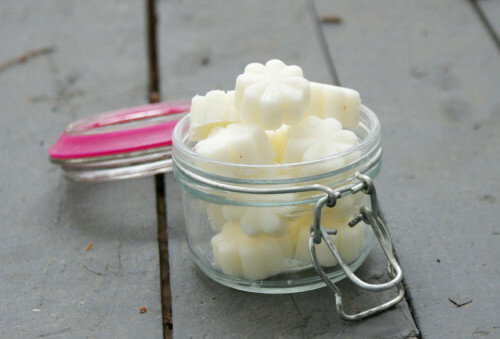 Not only is soy wax an inexpensive alternative to beeswax, it also has a much lower melting point – right around 120° F – which makes it perfect for utilizing in bath melts. I molded these natural bath melts in a Silikomart Silicone Chocolate Flower Mold . This recipe will fill all the cavities in one of these molds and yields fifteen flower shaped bath melts. To make these bath melts, begin by weighing out the soy wax, cocoa butter and shea butter using a digital kitchen scale then combine these ingredients together in a small to medium sized glass pyrex measuring cup. Heat in the microwave until melted, then weigh out the grapeseed oil and essential oil and mix into the wax and butters. Carefully pour the now liquid bath melts into each cavity of the mold then allow to harden fully. (If you place this mold on a cutting board before pouring you can easily transfer the mold to the fridge after pouring to hasten the cooling process.) Once the melts have solidified remove from the mold and store in an air tight container in a cool, dry location. To use simply add one to two melts to warm bath water or massage a melt onto your skin by hand when bathing in a bath or shower to soften and moisturize skin. Like this natural skin care recipe? Then be sure to also check out my natural lemon verbena bath melts recipe! You’ll also discover even more natural homemade bath melts recipes as well as other bath, body and beauty DIY’s by following my DIY Bath & Body board on Pinterest. Or follow me via Blog Lovin’ and never miss a post! You can also find me on Facebook, Twitter, Tumblr, Google + and Instagram! What could a person use instead of soy. There are many like myself that are allergic to it. You’d have to fudge the recipe a bit. I’m sure of other skin safe waxes with a melt point of around 120°F. You could try subbing part sunflower wax – I know Nature’s Garden Candles carries this – which has a much lower melt point with part beeswax. 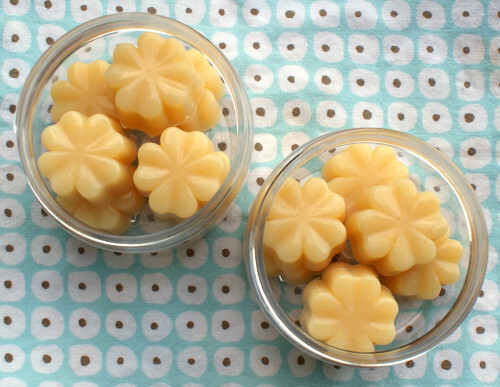 In lieu of the soy wax I would think 20 grams sunflower wax and 20 grams beeswax would be a good starting point and you can adjust the recipe as needed based on the results. Otherwise my lemon verbena bath melts have no soy. These are a bit softer and take longer to set up but you can increase the kokum butter or add a smidge of beeswax to make them a little firmer since we are heading into spring and summer. Thank you! I will look in to this and give it a shot. Not for my own info, but for Cindy perhaps…could you sub out that soy wax, and instead use 96 degree melt point Coconut oil? That way it would be solid at room temp and melt in the bath. Just a suggestion. Not everyone has that at home, but it could easily be purchased from most vendors that carry body product raw ingredients. I think that should have been 92 degree coconut oil. Either way, it is worth a try.